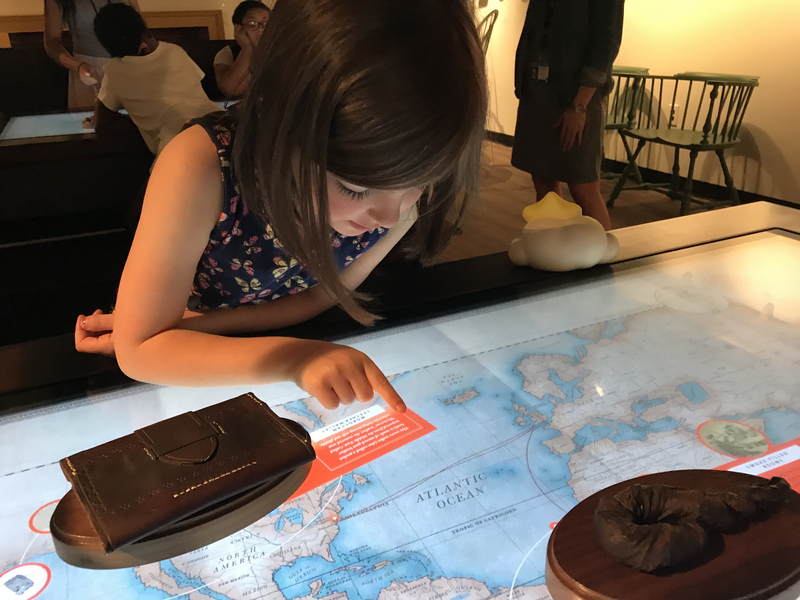 On June 9, the Museum of the American Revolution opened Revolution Place, its new interactive exhibit that is geared towards the museum’s younger visitors. I had never been to the MoAR before and was excited that there was an area catering to the my 4.5- and 6-year-olds so we could all take part in the museum experience together. There were actors in traditional colonial uniforms and civilian garb as we approached the museum. They were demonstrating how shoes were made and rifles were maintained back in colonial times. They were top notch in every way in their interactions with the kids and adults alike. I’m not sure if they are there every weekend, but they instilled excitement for what was to come. After stopping by Patriot’s Gallery, the established kids’ area where children can dress-up in the clothes, play with the toys, design flags, and see maps of the revolutionary times, we made our way downstairs to the Revolution Place. The interactive play began as soon as we entered the large room housing Revolution Place. The first area is the army encampment. The screen at kid-height encourages children to “enlist” for the continental army by signing their name with a “feather quill”. It was charming to be able to check the list for your name after enlisting and there were other pages describing all the considerations that were taken into account for those joining the Continental army (I saw something regarding a soldier’s salary), but after seeing her and her brother’s names, my daughter abandoned the screen to get in and start playing. The museum workers, dressed in colonial costumes, were right there to explain to the kids how the soldiers in the army lived while they were encamped with their regiments. There was a small tent and an explanation of how six (6!) men had to share it as well as an area memorializing the families that traveled with the armies. The women, with their children, often would accompany their husbands and do the chores of the camp, such as laundry and mending, while the soldiers were training and fighting. The next area we visited was the tavern. There were examples of food that was eaten and mock newspapers the children could handle. The big draw, however, were the tables that were interactive world maps. At each of these tables were everyday items, such as dice, tobacco, and dishes, attached to wooden planks. When the object was placed on the map, a window would pop up illustrating where in the world the item came from and the shipping route it took to get to the colonies. There were also windows of information about the items that explained their history and significance. My kids enjoyed the small animated ships traveling the world and the ability to switch from window to window of information, but since neither of them are on the level of reading necessary for self-directed learning, they moved on quickly even as I tried to read the information to them. Next stop was the parlor. Here the children saw where the families gathered in colonial times to eat, entertain, and sit in the evenings. There were examples of embroidery and tea sets that one would see back in the day. My kids enjoyed looking at the different items, but quickly moved on. We then headed over to the meeting room. There were a couple of mock gravestones against the outside wall that my kids had fun hiding behind. As we entered the church area, the kids went immediately to the large screens that displayed the images of people from different backgrounds. Each one explained how their experiences differed due to their different faiths. It was a lot of reading, so my kids moved on rather quickly after looking at the pictures. After visiting Revolution Place, I decided we should visit the rest of the museum. Unfortunately, my daughter is a bit skittish and the realistic depictions of warfare were a bit much for her. We were only able to breeze through the upstairs exhibit before we headed home. While it was an enjoyable experience, I think that the targeted age groups for Revolution Place should be a little older. I would have to recommend that kids brought here should have a rudimentary knowledge of the Revolutionary War and the era when it took place. The ability to be able to read above a kindergarten level would also be helpful in the interactivity. While my son is a tad under the focus age, my daughter was equally uninterested in the actual history because she didn’t know anything about it before we went. She only just graduated from kindergarten where the focus is on ABC and 123, not the War for Independence. If you want to go and your younger kids have not been exposed to American History yet, I would recommend priming them with some books or movies geared toward the younger crowd to give them a sense of excitement for the things about which they already have an understanding. I think if my kids had a point of reference, they would have been more interested in the historical significance of the experience. All in all, the Revolution Place is a fun destination within the Museum of the American Revolution for grade school level kids to learn about the life in colonial times. Revolution Place officially opened to the public on Saturday, June 9, and will be available from 11 a.m. – 3 p.m. (opens at 9:30 a.m. Friday – Sunday beginning June 16) from June 9 through September 3 (fall and winter hours will be announced). It is free with regular Museum admission.